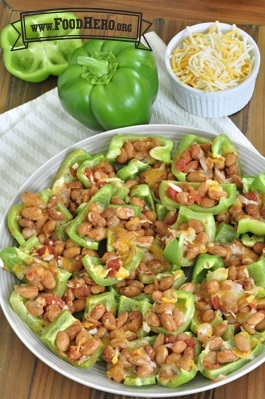 Wash bell peppers, remove seeds and cut into bite-sized pieces. Arrange pieces close together in a single layer on a large foil-lined baking sheet. In a medium bowl, combine salsa, seasonings and meat, beans or tofu. Spoon the mixture evenly over pepper pieces then top with cheese. Bake for 15 minutes, or until peppers are heated through and cheese is melted. Serve warm. For added flavor, top with chopped cilantro, green onions or black olives!